I’ve travelled to several places in the world, and I can tell you that some of the best food I’ve tasted is often street food. Well, Las Vegas is no different. 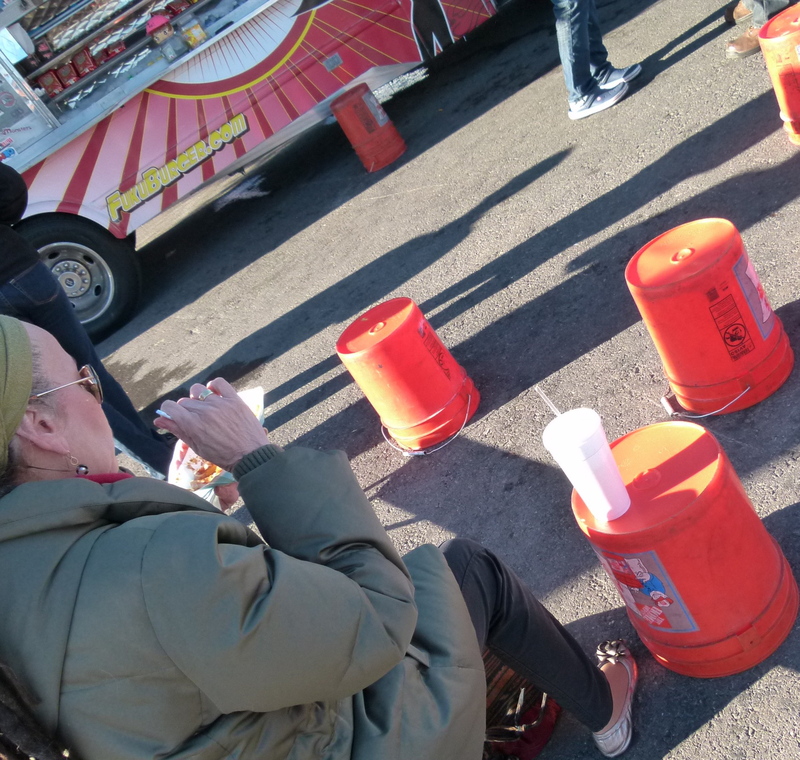 Street food in Las Vegas, is of the food truck variety. 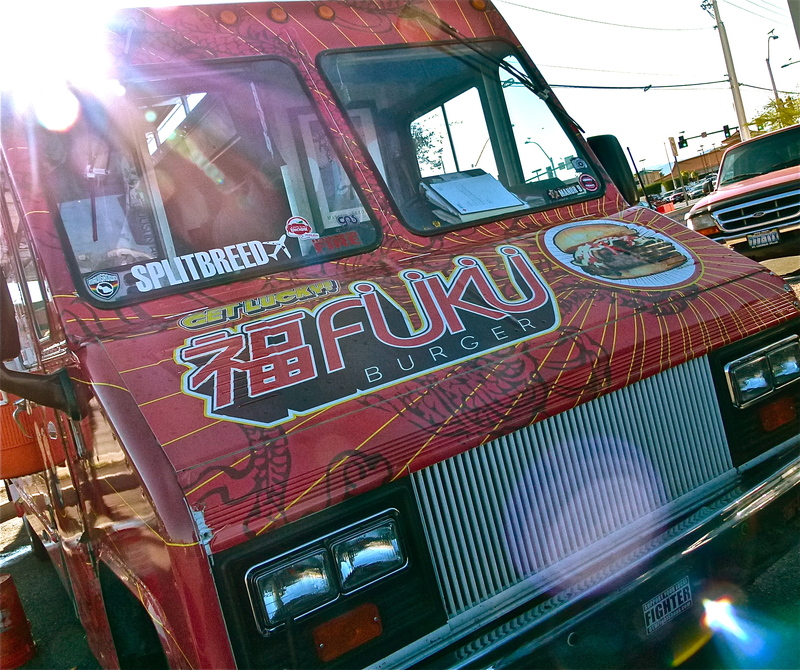 While there are several food trucks in Las Vegas serving up good eats, my current infatuation is with Fukuburger (Fuku comes from the last name of truck co-owner Colin Fukunaga and means luck in Japanese). While the Fuku patties themselves are yummy, cooked to perfection and made with beef from a local butcher, Larry’s Great Western Meats, what keeps me coming back is the unique Japanese inspired flavor combinations. Ingredients like kabayaki sauce, wasabi, ginger and kaiware sprouts, add unique flavor kicks that change the ubiquitous hamburger, into something oh so special. If I had to give Fukuburger a rating, it would be 5 mics. That’s right mics. Anyone who’s a fan of hip hop, or who’s ever read The Source, knows that 5 mics is the highest honor an album can receive. It means an album is a classic. Something that you can throw in your CD player and listen to all the way thru, without skipping any tracks. You might have your favorite song on a given day, but you love the whole album. That about sums up the way I feel about the menu at Fukuburger. And then, just when I think I might be getting bored with the menu, they’ll serve up an amazing special. It’s like the food world’s version of a mix tape. 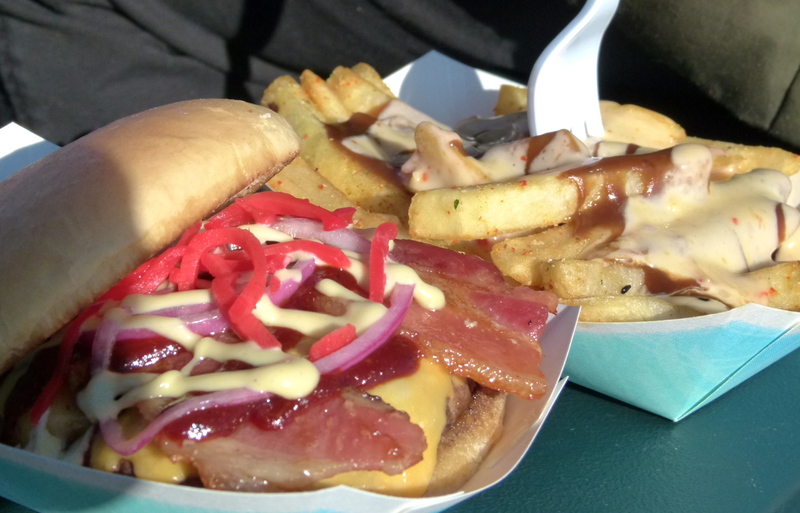 One day, I might be yearning for the smokey, sweet flavor of the Buta Burger, a Fuku patty with applewood smoked bacon, American cheese, pickled red onions, red ginger, japanese bbq sauce and wasabi mayo. On another day, I might feel the urge for a Tamago Burger, a Fuku patty topped with a fried egg, teriyaki, wasabi mayo and finished with crispy onion strings. The egg is fried over easy, so when you bite into the soft yolk, yellow egg juice goes running everywhere. Make sure you catch it in the little paper tray they serve the burgers in, so you can sop up a little of that creamy yellow egg juice, with each additional bite. If you want something to make your taste buds tingle, try the “spicy” Karai Burger, or an all beef hot link Naga Dog. And don’t worry, if you’re not in the mood for beef, Fuku Burger still has you covered, with the Chicken Katsu; a panko crusted chicken patty, topped with shredded cabbage, katsu sauce and “crack” sauce. Yes, “crack” sauce, aptly called because it will have you fiendin’ for more. To accompany your Fukuburger of choice, you can’t go wrong with either the Togarashi Garlic Fries or the Jazz Fries (shown above). The Jazz Fries are also topped with some of that “crack” sauce, and gravy. Currently, there is a Fukuburger restaurant in LA, but as they say, All the fresh Hollywood food places always start off as a good little hood thang. So, pull up a bucket, have a seat, and enjoy your burger. I know it’s been a long time since my last post, but something special happened in Las Vegas that inspired me to get back to writing about my favorite thing, food. Wednesday night was the grand opening of The Cosmopolitan. In total, The Cosmopolitan boasts 13 eateries. 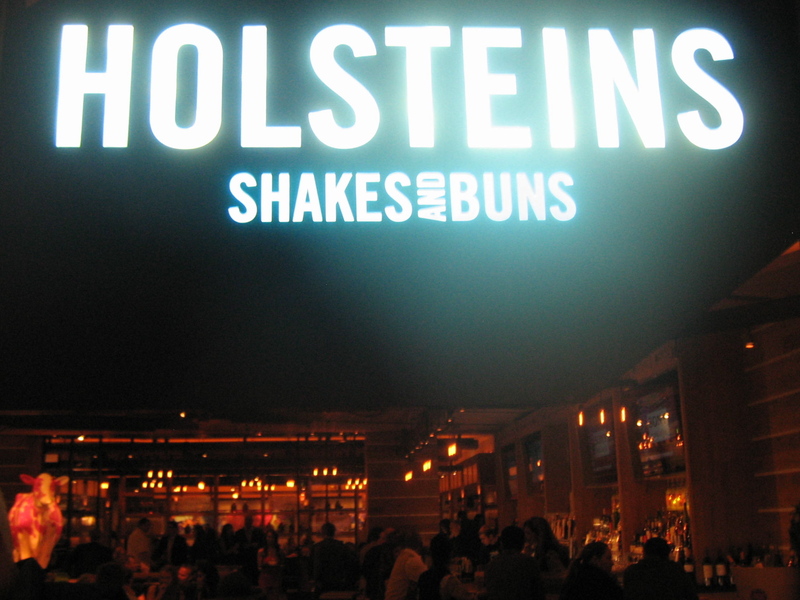 On opening night, one of my friends made reservations at Holsteins, a high-end burger joint at The Cosmopolitan. After looking over the menu, I decided on the Gold Standard Burger, your classic cheeseburger with a twist. 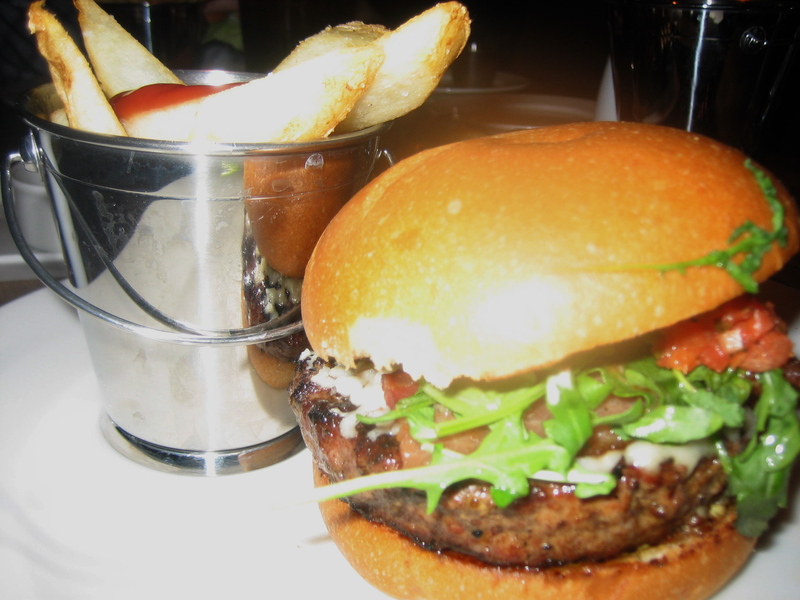 My burger, dry aged beef sirloin to be exact, arrived grilled to a perfect medium well. 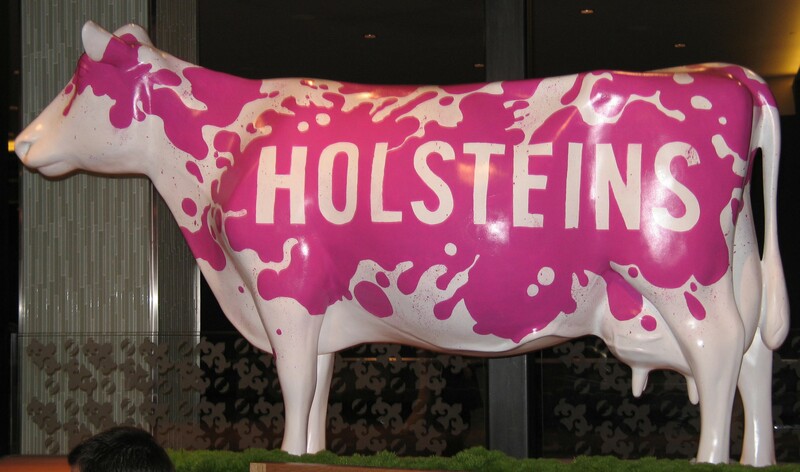 The Gold Standard spoke to the concept of Holsteins, premium burgers with premium ingredients. No processed American cheese on this burger, only aged cheddar, and hold the ketchup because this burger comes with house made tomato confit. The garlic chive aioli also offered a nice kick. Burgers come with either shoestring or steak fries but you can opt for the duck fat fries, which I suggest. I ordered a side of Smashed Potatoes, which actually weren’t smashed but rather baked fingerling potatoes covered in melted cheddar cheese and bacon, served with a side of scallion aioli. The scallion aioli was the highlight of the Smashed Potatoes for me. While I enjoyed the Gold Standard, I would also suggest the Longhorn, which my friend ordered. The burger is topped with everything you’d want at your bbq: brisket, BBQ sauce and Cole slaw. The Rising Sun is also worth trying. It really captures Japanese flavors in a burger. The burger itself is made of Kobe beef, covered in a teriyaki glaze and sprinkled with nori furikake, a traditional Japanese rice seasoning, then it’s topped with crispy yams, spicy mayo and a tempura battered slice of avocado. If you have room for dessert, you have to try the Coffee and Donuts. 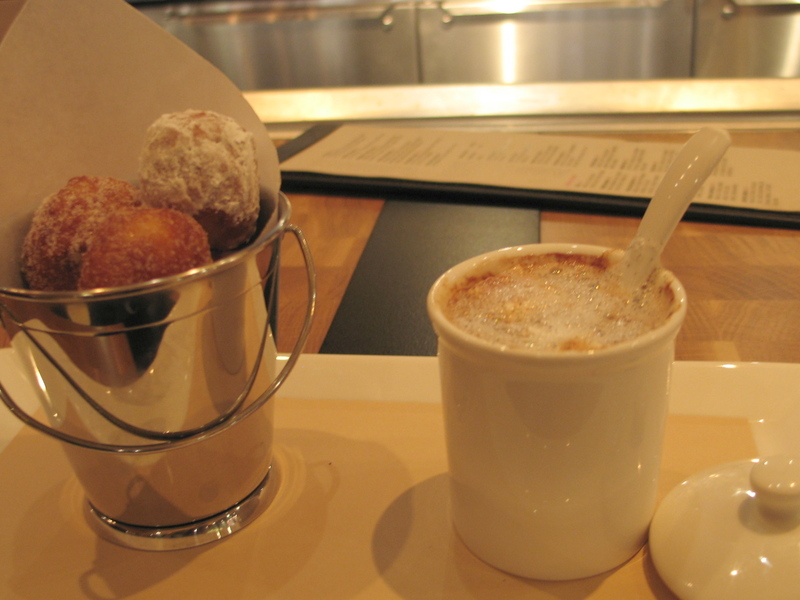 What you’ll get is a cup of espresso chocolate “soup” with mini marshmallows and a side of bombolinis, Italian donut wholes with a lemon, vanilla or gingerbread filling. I definitely see late night cravings for bombolinis and chocolate espresso in my future. Holsteins menu isn’t up on their website yet, but it include items besides burgers. You’ll find duck tacos, various house made sausage and dogs. And for you non-meat eaters or “grazers” they have salads and an Urth Burger, a vegan patty that comes in a tiny bun and a full size version. You can also build your own burger if one of their selections doesn’t interest you. And I can’t forget Holsteins alcohol spiked Bam-boozled Milkshake, which I’ll have to try on my next visit. About 5 years ago I swore off fast food, it was the day I rented Super Size Me to be exact. One of the special features on the DVD really grossed me out. It compared McDonald’s food, versus “real” hamburgers and french fries when left out to let nature take its course. I’ll spare you the gory details, but let’s just say the McDonald’s food went through some very unnatural changes, to say the least. That was all I needed to say goodbye to fast food, at least until I moved to Las Vegas. 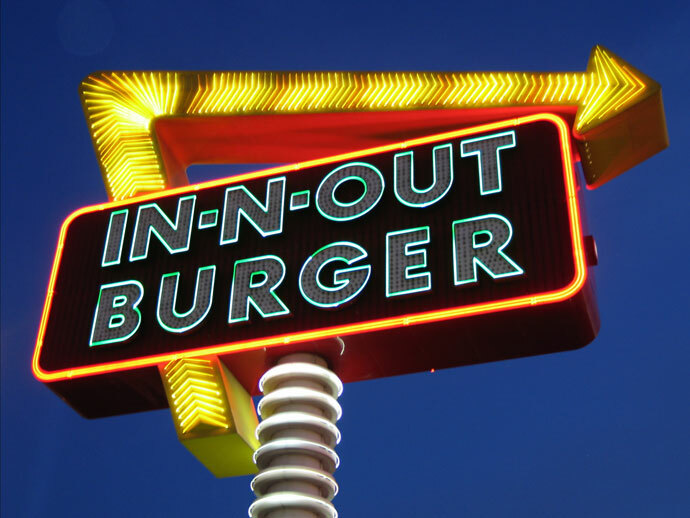 On trips here in the past, I’d seen the blinking In-N-Out Burger lights from across the Strip, but I had sworn off fast food so I never even thought about trying one. That was until one of my friends from back East, who had moved out this way, convinced me that In-N-Out Burger was different from anything we had at home. So I broke my nearly 5-year renunciation of fast food and had my first In-N-Out Burger. 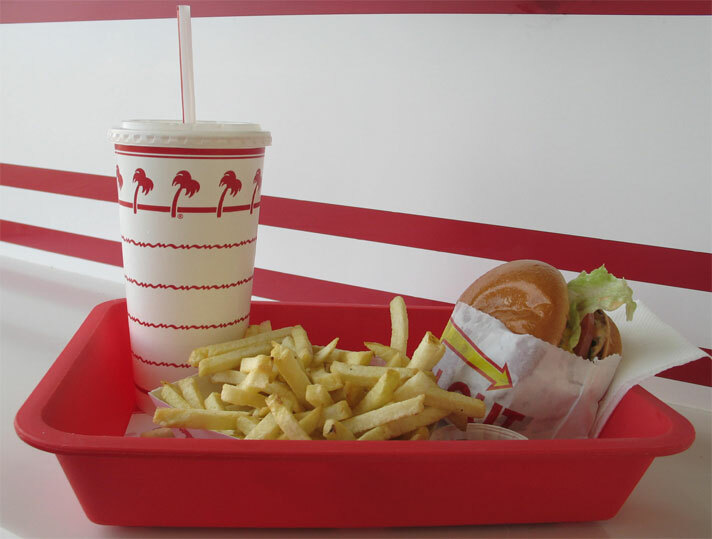 The first day I entered In-N-Out Burger, I was shocked that there weren’t any heat lamps or microwaves and someone was in the back actually cutting french fries from whole potatoes. And then I bit into my burger and fell even more in love with this place. The pickles were crunchy like in the pickle commercials, the lettuce was crisp and cool, the tomatoes juicy, the cheese gooey like real melted cheese should be, and the buns were plump and glistening like they were just pulled out of the oven. As much as I enjoyed my burger, I felt somewhat slighted that those on the western half of the country had kept this secret from the rest of us. I still consider it fast food, but with “Quality you can taste”. I don’t think they could have picked a better slogan. I’ve even caught on to their “secret” menu now. 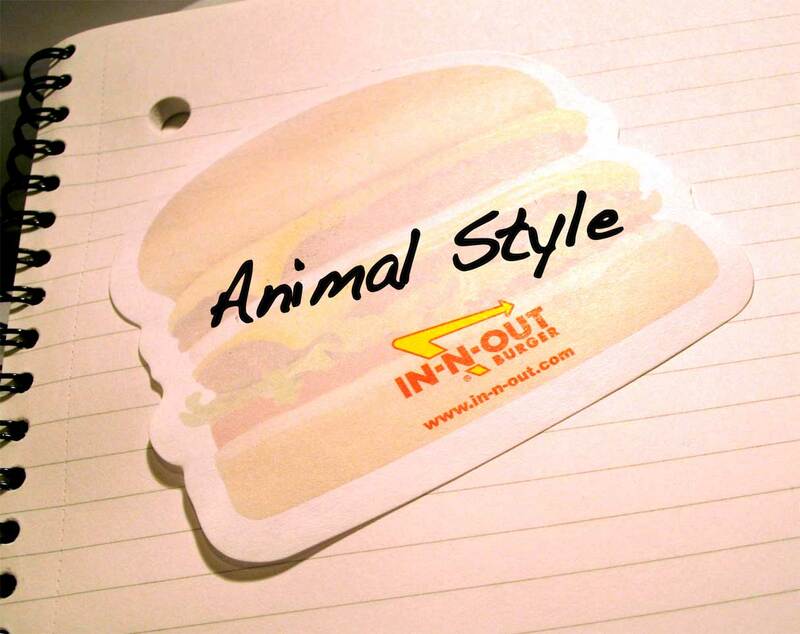 That will be one burger, animal style with fries.